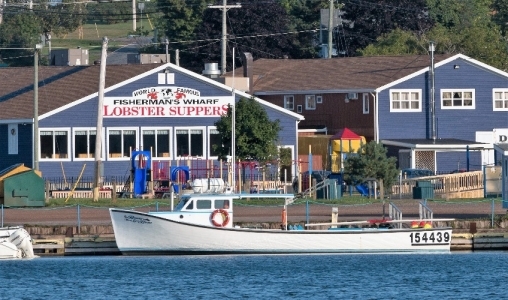 A traditional PEI lobster supper with the famous all-you-can-eat 60 foot salad bar, including mussels, chowder, salads, desserts and beverages. Lots of entrée options or enjoy our a la carte Pier 15 Restaurant in the same location. Kids menu and large gift shop on-site. Open May 12th to mid October. Reduced hours in May, June, September and October. Overlooking the Rustico Bay, Prince Edward Island's only artisanal cheese farm, Glasgow Glen Farm, produces world-class Cheeseladys Gouda. Don't forget to grab a loaf of bread or pizza with your cheese, baked fresh from our wood fired oven! Watch the cheese being made as well as sample some of our 13 flavours of PEI Gouda. Farm market produce in season! A truly unique PEI experience. Family owned and operated. Malpeque oysters fresh from our own beds. Shellfish from local fishers to the table. Come sit on our deck, savour the sea and watch the boats and bridge jumpers in the harbour as we celebrate our 20th anniversary. Land and sea menu choices. On-site gift shop & marine aquarium. Family fun times on the North Shore with Champion Oyster Shuckers and local entertainment.